Coming into the season, the biggest question facing the Milwaukee Bucks was one of fit. Their ceiling was going to be defined by how well their diminutive, shot-happy backcourt of Brandon Jennings and Monta Ellis could co-exist. Armed with a full training camp, it was left to head coach Scott Skiles — known for his defensive acumen — to devise a creative offensive scheme that made all the pieces fit. Like Rick Carlisle does year in and year out in Dallas, Skiles has built a system with concepts that allow his primary creators to not only play to their strengths, but also to avoid their weaknesses. For both Jennings and Ellis, that means minimizing the number of times they’re forced to create with the ball in their weak hand. Ellis, in particular, has diminished effectiveness when forced to his left, something that can occur quite often when teams use “down” side pick-and-rolls or execute a “weak” coverage on ball screens in the middle of the floor. This video does a great job capturing how hesitant Ellis is when the ball is in his left hand. Instead of attacking the retreating big, Ellis spins over the top of the on-ball defender and pushes himself closer to halfcourt than to the basket. This further crowds the right side of the floor, and his only option is a pass back to screener Larry Sanders. Sanders is relatively skilled for a big man, but asking him to make a play with the ball 20 feet from the rim is hardly a recipe for success. In order to prevent defenses from forcing Ellis into situations like this, Skiles implemented an offense heavily reliant on dribble hand-offs (The same one that piqued Zach Lowe’s interest last week) Unlike pick-and-rolls, which often end up becoming quite slow and static, a handoff requires both players to be on the move while the action takes place. This accelerated pace, along with an active dribble, makes it impossible for NBA defenders to force a player away from either the middle of the floor or his preferred hand. For someone as explosive and right-hand dominant as Ellis, it can be an easy way to generate clean looks. The key difference between pass-and-follow pick-and-rolls and dribble handoffs like the one in the clip above is the threat of the backdoor cut. Because teammate Ersan Ilyasova is dribbling toward Ellis, any attempt by Ellis’s defender — in this case Boston’s Courtney Lee — to aggressively deny him would result in a backdoor cut for what would likely be an uncontested dunk. Had Ilyasova simply swung the ball to Ellis and followed that with a screen — like a vast majority of NBA teams ask their big men to do in that situation — Jeff Green, who’s guarding Ilyasova, would have slid toward the block while Lee would’ve jumped to Ellis’ top shoulder, forcing him toward the baseline and making Ellis use his shaky left hand. 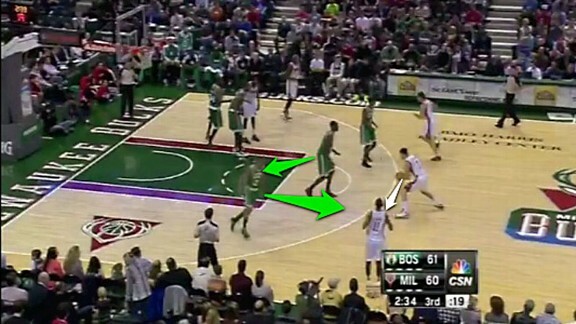 For the Bucks, there’s an added perk for replacing pick-and-rolls with this type of action. The Ellis-Jennings duo is among the quickest, most agile backcourts in the league, and they use that athleticism to curl quickly around screeners while defenders struggle to keep up. Jennings primarily receives handoffs in the team’s base offense, but Ellis — the superior finisher — has specifically designed sets to free him with the same action. While the design is thoughtful and innovative, this scheme still can’t overcome one of the key reasons this pairing was suspect to begin with — the shot selection of Ellis. No matter how well-conceived a play or scheme is, it still requires players to identify when and where the shots come from. For a volume scorer like Ellis, that means a sliver of space at nearly any spot on the floor is enough reason to put up one of his unreliable jump shots. With Jennings nearly as imprudent in his approach, the Bucks’ offense ranks an unimpressive 17th in offensive efficiency. And thanks to Ellis’s defensive deficiencies, the duo is -27 in the 350 minutes spent on the floor together so far this season. Whether it’s moving Ellis into the role of sixth man or even issuing a mea culpa on the original trade and moving him for better-fitting pieces, it would behoove the team to explore every avenue that could correct this problem. If the pair is unable to improve on its own, it could spell trouble for a front office and coaching staff whose job security seems dependent on a playoff berth. The Central Division is as weak as it’s been in years, so the present is as good a time as any for the Bucks to stake their claim. Earning homecourt advantage in the first round would put them in position to advance to the Eastern Conference semifinals for the first time since 2001. That feat will require Milwaukee’s undersized backcourt to accomplish much bigger things than they have together so far this season.